Pump up your Halloween decor with easy to make brandy glass pumpkins. If you have a brandy snifter or two, an ivy bowl, or any similar shaped glass with a round body, then you can easily make these little pumpkin decorations to hand out snacks for Halloween. This is one of the easiest pumpkin crafts you’ll ever do. First, wash and polish the brandy snifter, ivy bowl or glass vase. Fill with your choice of orange-colored snacks, candy or treats. If your plastic wiggly eyes are self-adhesive, stick them to the glass, about an inch apart and on a level with each other. If the plastic eyes are not self-adhesive, apply white glue or household glue to the back of each eye, then set the eyes in place on the glass and let dry. Draw a happy face, Halloween smiley, or another mouth shape in black marker, directly beneath the eyes. If you make a mistake and work quickly, you should be able to easily erase your work and try again. 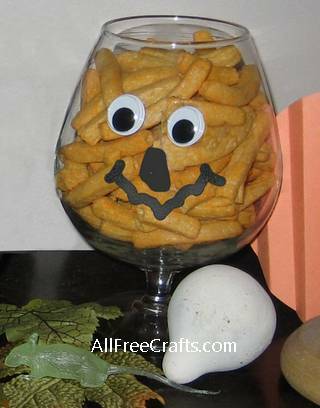 Once you have a Jack o’Lantern face that looks pleasing, set the bowl where desired in your Halloween decor. Sets of three or more, with each glass or snifter filled with a different snack, can be set out together to great effect.